April 20, 2018 (Vancouver, BC) – “This is a historical moment for many Chinese Canadians and especially for family like me who are descendants of Head Tax payers and Canadian railway workers. “It is important for Vancouverites to understand and acknowledge the history of Chinese segregation and racism in Vancouver. 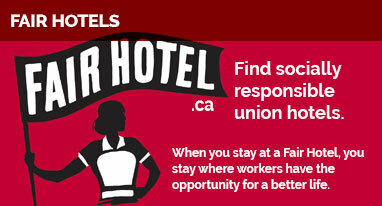 Fairness is essential and that’s what drives my service with the union. “Many hospitality workers of UNITE HERE Local 40 are immigrants and many of them are from China. They work under challenging and precarious conditions like long hours, heavy workloads and risk of injury yet they earn only minimum pay with no job security. They have endured much hardship to build a life here, and their contribution to the success of Vancouver’s hospitality industry is often unrecognized.